So, on my favorite etsy team, Paper Twirlies, we’re discussing different paper storage methods. There are various creative methods of storage, so I thought I would share my storage. I actually found this on a blog somewhere, but for the life of me, i couldn’t find it again. So, if you are the one that came up with this storage method, let me know and I’ll give you credit. These binders are basically filled with sheet protectors, but have been divided in half using a food saver machine to melt the two sheets together. I have a little sheet of paper stuck in each one that lists what color it is, as well as what company its from and the product number for that color. 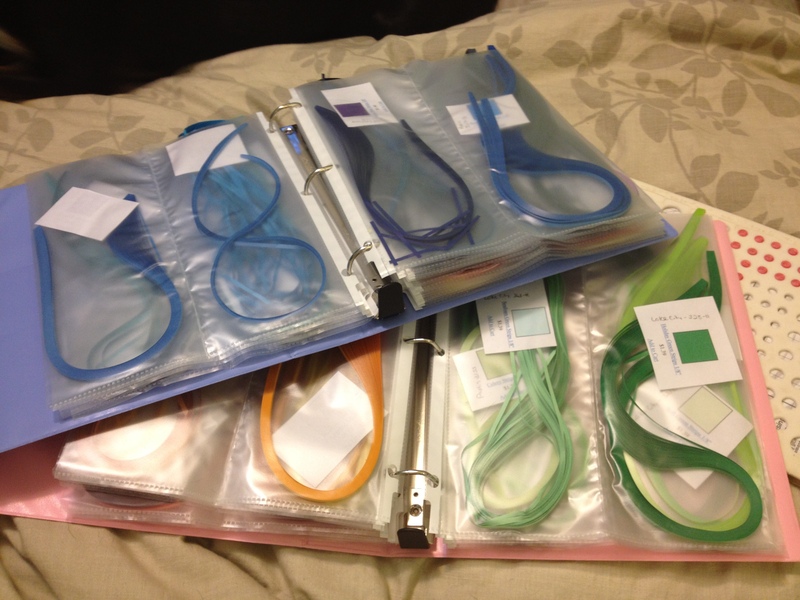 I have three 2″ binders filled with paper like this, and I keep them in a reusable grocery sack. I’ve tried various ways of storing my paper, and this is the one that has worked best for me. I like that the paper is organized, and keeping them in binders in a grocery sack makes it easy for travel (the last time I took it out of my house was when I was quilling at Panara’s over Christmas break). I think I saw someone organize similar sheets for something but they sewed the dividers. Great idea! Space saving and portable! That is a cool idea, and it’s great like you mentioned to be able to travel with them; I have to keep my papers in containers for travel for when I attend crafty days with my friends. Thanks for sharing.